All Our Yesterdays: Is This The End For Sci-Fi Drama? Next: Thoughts on V: "Mother's Day"
The Stargate franchise is dead, the excellent Fringe is on the rocks, Smallville is nearing its natural conclusion and the Battlestar cogs are winding down. You'd think that the dismal state of Western sci-fi would spur on a drive to replace the void with new, engaging material, but — possibly due in part to financial considerations, and definitely due in part to decreasing viewer expectations — in fact very little remains on the horizon. And with Sunday evening in the UK came the end of yet another promising sci-fi drama. 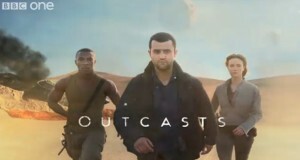 No, Outcasts wasn't perfect, but it was a solid show, brought to an untimely end by the relentless criticism of a society that would rather watch Harry Hill shove ice cream up his arse on TV Burp, or watch Matt Baker ride a bus past a village Post Office — closed, naturally — on Countryfile, than actually invest their time in quality drama. No wonder the programming schedules are filling up with reality rubbish on both sides of the Atlantic. Such a pity. At least we can probably rely on Doctor Who for a few more years… maybe.